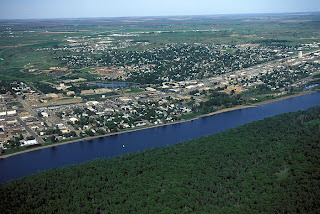 The main channel of the river is the on the west side of the island, just out of the picture here. For photographers, LaFramboise Island provides an abundance of scenery and wildlife to shoot. 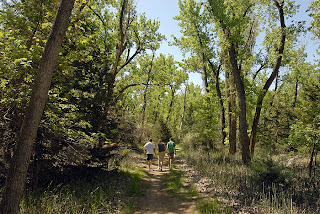 Hiking and biking trails crisscross the island and provide access to dense undergrowth forest and views of the Missouri River. 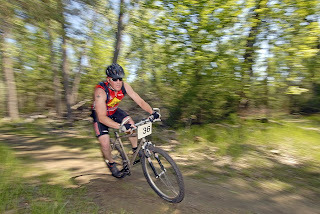 Occasional mountain bike races and other events are held on the trails. 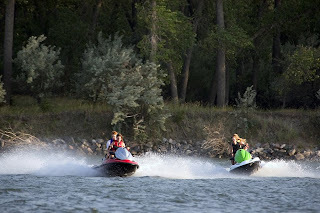 South Dakota's Department of Game, Fish and Parks administers the island. There is no usage fee, and maps are provided near the parking area for a 16-station interpretive nature trail loop. 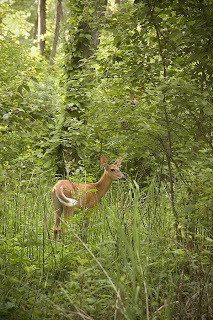 Wildlife on LaFramboise Island include whitetail deer, beaver, bats, squirrels, fox, snakes and frogs. 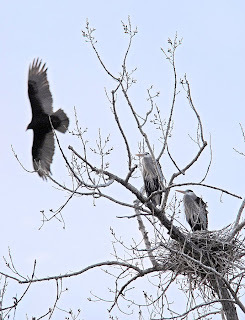 Over 120 species of birds have been spotted here as well, including nesting great blue herons and ominously-circling turkey vultures. Bald eagles also use the island as a nesting spot in winter months, so a portion of the trail system is closed to keep from disturbing them. 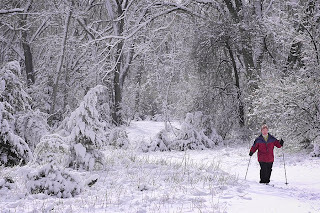 Speaking of winter, activity does not stop with snowfall, but instead makes a great hiking and cross-country skiing venue. The presence of water means people taking advantage of it's recreational aspects. The island's dense tree growth makes a great backdrop for pictures of boaters, fishermen and swimmers. More information about LaFramboise Island can be found at http://www.sdgfp.info/parks/Regions/OaheSharpe/LaFramboiseIsland.htm. I think I have your house picked out, it is the one between the other two white dots. That's the one! Good spotting!